If there’s one thing us Americans know how to do, it’s Halloween. This holiday (yes, we can definitely call it that) has always been a big tradition in my family. As for me, I was that girl who continued to trick or treat until she was a senior in high school. We got quite a few weird looks that year, but that’s beside the point. When I was in 8th grade, I started to make my own costumes and I’ve been overachieving at Halloween ever since (this year, I painted my own cat mask in the style of el Día de los Muertos.) I love this day and its use of legends and mystery, focusing on the dark corners of night where anything seems possible. I always preferred the magic element over the fear part; I was terrified of the Party City Halloween display until I was 12 years old. Think about it – just for one night, you can be literally whoever or whatever you want. And on a less philosophical note, I love eating candy and carving pumpkins is a blast. What’s not to love? 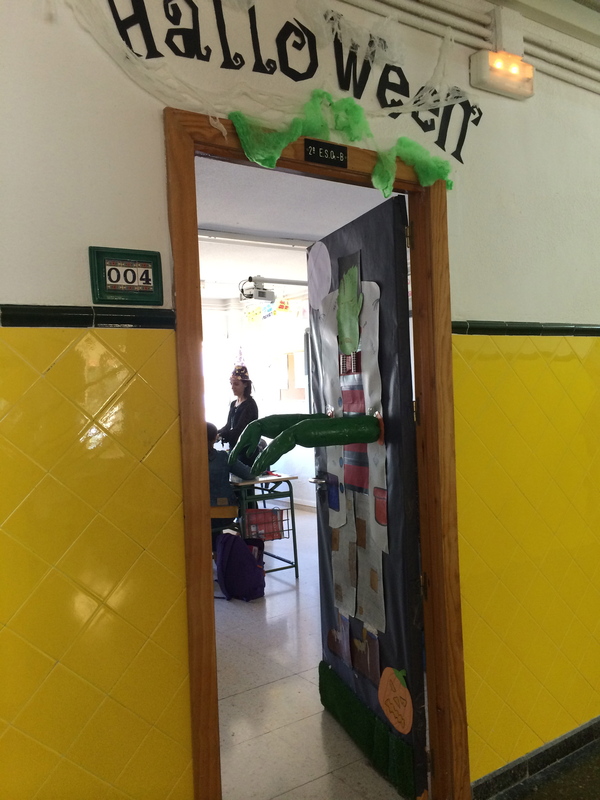 I wasn’t sure how Spain celebrated Halloween, or if they even did at all. Would they decorate? Do people actually wear costumes? Where on Earth was I going to find a pumpkin? Do they even have them there? 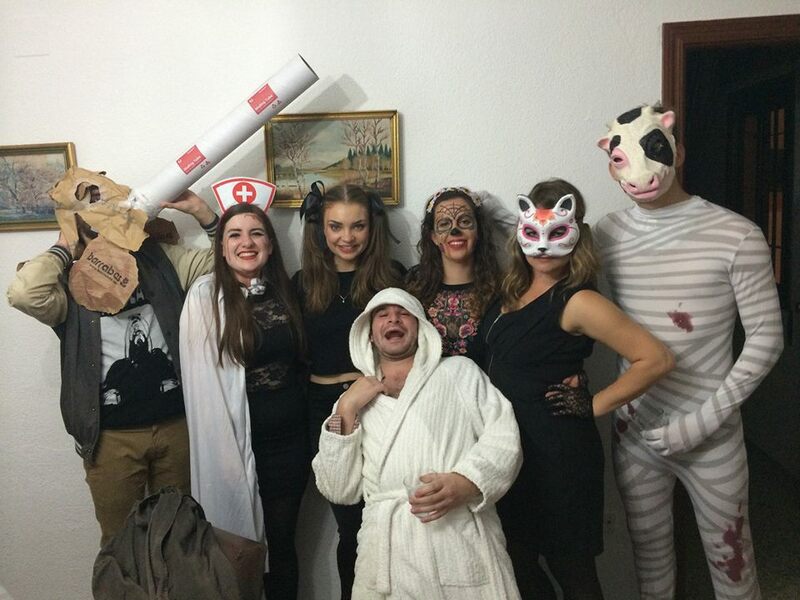 Well, it turns out that Spain does in fact recognize Halloween. 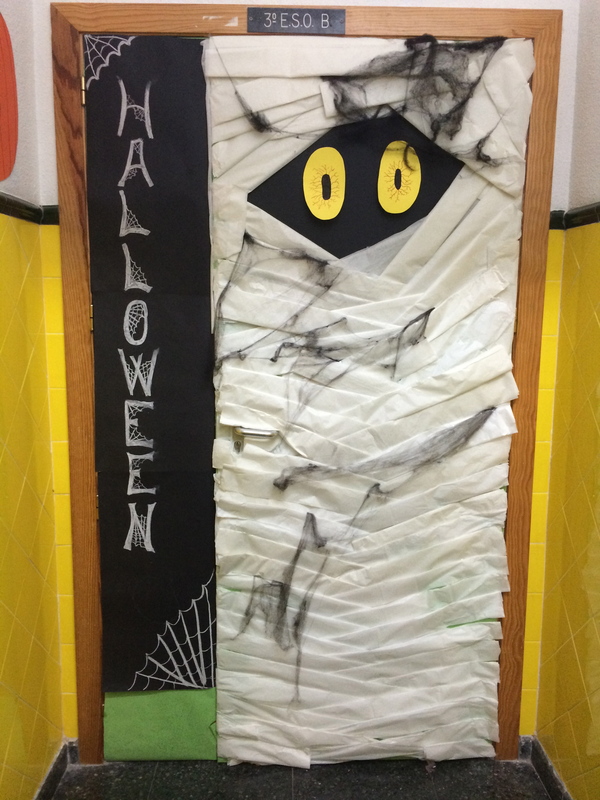 The classes in my school decorated the doors of their rooms with skills ranging from adorable to damn near professional. In general, the focus here is definitely more on the horror aspect than the general, shall we say “experience.” For example, they were blown away when I came to school dressed as a farmer — a bit of last minute ingenuity on my part since the mask wasn’t finished yet, plaid never fails — and not as a witch or vampire. “You can… dress as a farmer?” My coworker asked me, mystified. 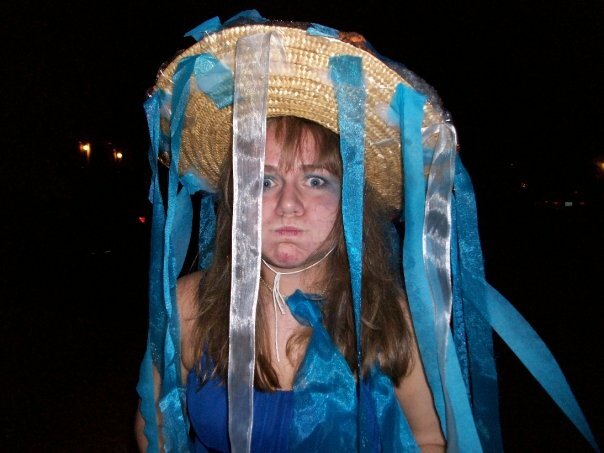 I wanted to tell her I had even gone as a jellyfish once, but I chose not to complicate the issue. When I asked a group of students what their costumes were, there were demons, zombies, and not one, but two exorcist children. 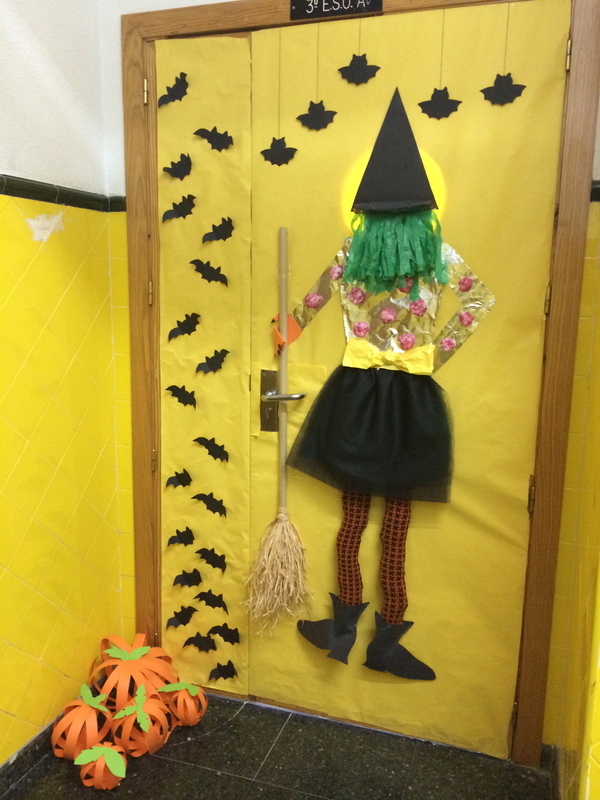 The next eye opening experience came with witnessing the Halloween English theater. These 5 minute skits included such light subjects as vengeful ghosts, ouija boards, murder, suicide, and bloody hatchets. They were all impressive, but my favorite was hands-down the Ghostbusters adaptation that featured John Cena, McLovin, and a capoeira ghost-dance fight. It reminded me of my own smashing piece of high school Spanish theater about Jackie Flan, Sherlock Rolls, and the Gran Queso. 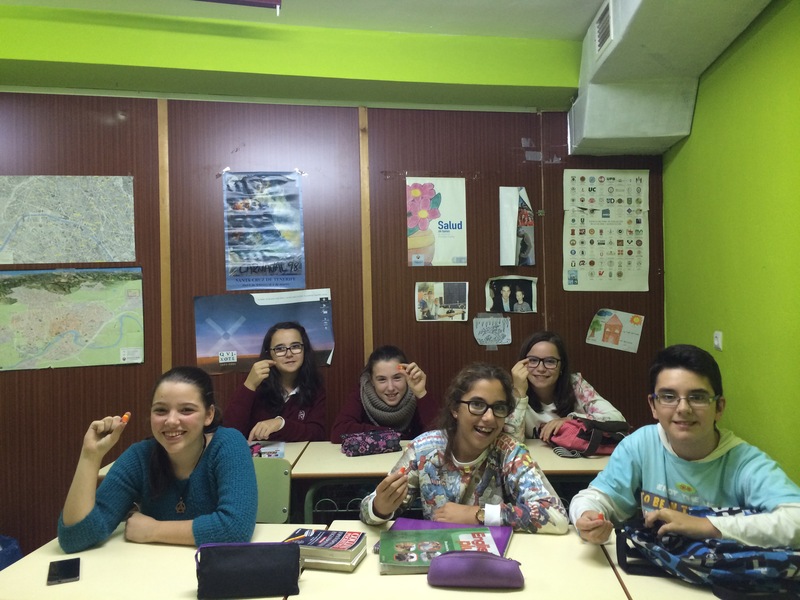 Part of my job as a Language and Culture Assistant is to share the customs and traditions of my land with the youth of Spain. What better way than to introduce them to that ever-delicious, quintessential icon of my childhood: Candy Corn. I smuggled three bags of goodness with me from the US and shared them in my classroom. Yay! Our first Candy Corn! 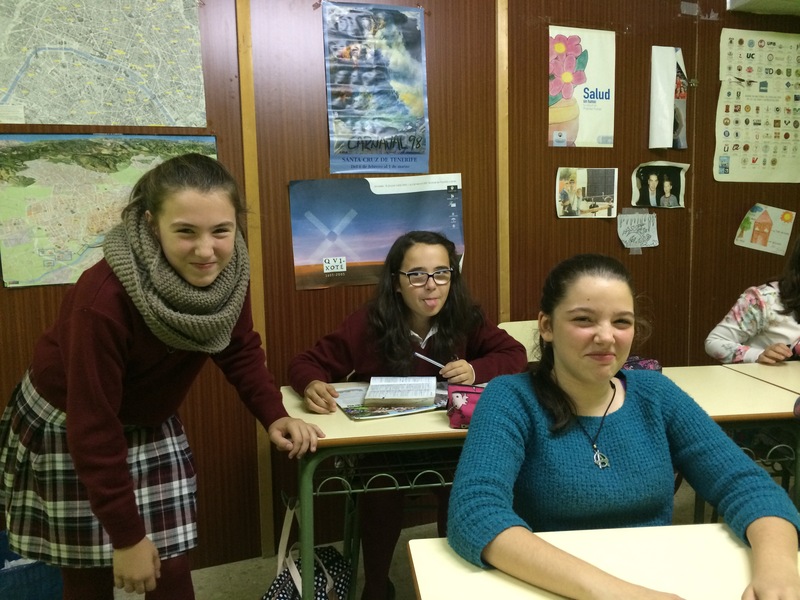 One girl asked to go to the bathroom to spit it out, but the rest of them choked it down. You would have thought I had passed out raw chicken brains or something. These faces say: wtf is this American poison. I suppose not everyone can withstand the pure, concentrated, food-colored sugar triangle that is Candy Corn. While I did not succeed in spreading the love of these candies, at least I perpetuated the stereotype that Americans have a sweets’ problem. Perhaps Halloween was not the same as it is at home, but spending it in an ancient, haunted city was pretty darn cool. Costume crew… can you guess what we all are?